The weather last week did not improve much until Thursday so due to the weather and an invitation to attend a dinner in Austin, we decided to reschedule Board. A new date will be set this week. To the two who came , we apologize but messages were all over the county trying to track you down. The Texas Historical Commission Board meets four times a year with two meetings in Austin and two around the state. Apparently when they meet in Austin , the Chairman hosts a dinner to meet with the commissioners, government officials , and county historical commission boards who have achieved preservation goals during the year. 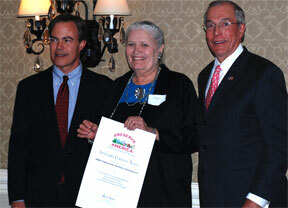 This last Thursday, they recognized those who had achieved the designation of a preserve America community. I was asked to attend as our representative. It was a pleasure and the evening was very interesting,educational, and enjoyable. I was able to meet the commissioners, new Texas speaker of the house, Mr. Straus(not sure of the spelling, forgive me if incorrect), and other communities who were being recognized. I was able to educate them on where we are located, who we are, and what we need from them. It was a great opportunity for our Historical Commission and our goals. Thanks to your support of our efforts we are able to represent you with these state officials. Since I was in Austin, I was able to pick up our original map that the conservator had restored. We displayed the copies this summer . The originals will be framed and hopefully we will be able to work with a historian to develop an exhibit with the intrepretation of the map for a permanent exhibit with the new expansion. Tours with the local schools are now being scheduled. The Booker third grade visited us Wednesday morning and they were a delightful group. Lovella prepares history questions for each group of these from their Town in the museum, an artifact or a historical fact . The students go in groups and look for the answers. This year the Booker model train was a special focus of interest. We look forward to other groups. The Lipscomb County Livestock Show brought a big crowd to town. We opened the museum so parents and students could take a break and come and see their students art work. We had a steady stream of visitors all day. From all reports , the show was very successful. A request for a scanned copy of a page for the 1959 Roundup annual led me to reading the annual and the thought to share with you some of the contents of that year. This is the annual of Darrouzett Schools . The Supertintendent was Robert L. Green who in his message to the annual student staff made this statement "To the patrons who will study this pictorial history: Your knowledge and understanding have helped these seniors to achieve this much of the (life) journey. I and they are grateful for your help and wish you the greatest enjoyment as you use this book." The annual is a historical record of county businesses who bought ad in annual some still in business (I think) Ragan's Locker, First National Bank for example. Some who are not i.e. Follett Snooker club , Brown's Grocery, and McDonald's Dept. Store. The student activities ,clubs, and honors were very similiar but different from today schools. The favorite catagories were : Miss and Mr. D.H.S. (Marilyn Cross and Henry Altmiller);Best Citizens (Ronald Schneider and Helen Ann Meier); Best All-Around (Marilyn Cross and Gary Herber); Most Likely to Succeed: (Helen Ann Meier and Gary Herber); Most Athletic (Vera Miller, Gary Herber); and class favorites: Senior: Peggy Whittaker and Jerry Piel; Junior: Larry Schoenhals and Vera Miller; Sophomore:Maudine Longhofer and Glen Schneider; Freshman: Luella Koch and Merle Custer. Student organizations were the Longhorn staff (newspaper), the Pep club, F.H.A. (Future Homemakers of America. ), F.F.A. (Future Farmers of America.) , Rhythm Band (elementary school), Septette (singing group -High School), Cafeteria Workers , Office Workers, and Student Librarians (high school students) . Annuals record our students, teachers, and our activities for our schools. Beside recording your memories they record accurately our history. Thanks for this pictorial history. To those of you from the class of '59 your record is to be commended.